Z-Home has been in the spotlight recently as the first zero-net energy and carbon neutral multi-family development in the United States. Now that construction is complete, we examine some of the lessons learned from this first of its kind development. 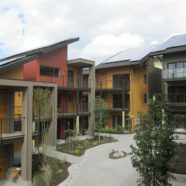 Z-Home project manager Brad Liljequist of the City of Issaquah’s Resource Conservation Office joins Terry on The Eco-Logical Home to share his insight in this 30-minute interview. Follow this link to listen!